You’ve just committed the perfect crime. No one saw you do the crime, and you left no trace. The perfect crime. The only way anyone could prove you did it is by finding the journal of your master plan. Get rid of the journal, and you are scot free. You want to be absolutely, 100% certain that the information it contains is permanently destroyed. Suppose you toss your journal into a black hole. Would that destroy all traces of your plan? Physics equations are about information. The answer to this hypothetical scenario lies at the heart of the information paradox. Stated more generally, the paradox raises the question: can information be destroyed? The question is important because it strikes at the very heart of what science is. Through science we develop theories about how the universe works. These theories describe certain aspects of the universe. In other words they contain information about the universe. Our theories are not perfect, but as we learn more about the universe, we develop better theories, which contain more and more accurate information about the universe. Presumably the universe is driven by a set of ultimate physical laws, and if we can figure out what those are, then we could in principle know everything there is to know about the universe. If this is true, then anything that happens in the universe contains a particular amount of information. For example, the motion of the Earth around the Sun depends on their masses, the distance between them, their gravitational attraction, and so on. All of that information tells us what the Earth and Sun are doing. In the last century, it’s become clear that information is at the heart of reality. For example, the second law of thermodynamics. In its simplest form it can be summarized as “heat flows from hot objects to cold objects”. But the law is more useful when it is expressed in terms of entropy. In this way it is stated as “the entropy of a system can never decrease.” Many people interpret entropy as the level of disorder in a system, or the unusable part of a system. But entropy is really about the level of information you need to describe a system. An ordered system (say, marbles evenly spaced in a grid) is easy to describe because the objects have simple relations to each other. On the other hand, a disordered system (marbles randomly scattered) take more information to describe, because there isn’t a simple pattern to them. So when the second law says that entropy can never decrease, it is saying that the physical information of a system cannot decrease. What began as a theory of heat has become a theory about information. We live in a predictable universe. It’s generally thought that information can’t be destroyed because of some basic physical principles. The first is a principle known as determinism. If you throw a baseball in a particular direction at a particular speed, you can figure out where it’s going to land. Just determine the initial speed and direction of the ball, then use the laws of physics to predict what its motion will be. The ball doesn’t have any choice in the matter. Once it leaves your hand it will land in a particular spot. Its motion is determined by the physical laws of the universe. Everything in the universe is driven by these physical laws, so if we have an accurate description of what is happening right now, we can always predict what will happen later. The future is determined by the present. The second principle is known as reversibility. Given the speed and direction of the ball as it hits the ground, we can use physics to trace its motion backwards to know where it came from. By observing the ball now, we can know from where the ball was thrown. The same applies for everything in the universe. By observing the universe today we can know what happened billions of years ago. The present is predicated by the past. These two principles are just a precise way of saying the universe is predictable, but it also means information must be conserved. If the state of the present universe is determined by the past, then the past must have contained all the information of the present universe. Likewise, if the future is determined by the present, then the present must contain all the information of the future universe. If the universe is predictable, then information must be conserved. Quantum theory is also predictable. Now you might be wondering about quantum mechanics. All that weird physics about atoms and such. Isn’t the point of quantum mechanics that things aren’t predictable? Not quite. In quantum mechanics, individual outcomes might not be predictable, but the odds of those outcomes are predictable. It’s kind of like a casino. They don’t know which particular players will win or lose, but they know very precisely what percentage will lose, so the casino will always make money. The baseball example was one of classical, everyday determinism. To include quantum mechanics we need a more general, probabilistic determinism known as quantum determinism, but the result is still the same. Information is conserved. So what about black holes? At first glance it would seem that black holes destroy information. If you toss an object into a black hole, the object (and all its physical information) is lost forever. It is as if the information of the object was erased, which would violate the basic principle that information cannot be destroyed. Now you might argue that being trapped is not the same thing as being destroyed, but for information it is. If you cannot recover the information, then it has been destroyed. So it would seem that black holes “eat” information, even though the laws of physics say that shouldn’t be possible. This is known as the black hole information paradox. The object’s experience (red) vs. our observation. But it turns out things are actually more subtle. In general relativity, once a black hole forms it exists forever. If more matter is thrown into it, it can grow larger, but it never goes away. This is important, because if black holes live forever they don’t actually destroy information. Since time is relative things get a bit strange. For example, if you were to toss your crime journal into a black hole, how long would it take to reach the event horizon? From the journal’s perspective, it will cross the event horizon and enter the black hole in a finite amount of time, but from the outside observer’s view the event horizon is never reached. Instead the journal appears to get ever closer at an ever slower pace. Any outside observer will see the time of the falling journal get slower and slower as the black hole warps spacetime more and more. From the outside it appears that the journal never quite enters the black hole, and so its information is never lost. But suppose we took an object and compressed it into a black hole. According to general relativity, a black hole has three measurable properties: mass, rotation (angular momentum), and charge. That’s it. If you know those three things, you know all there is to know about the black hole. So a black hole is much simpler than other massive objects such as planets, stars and the like. It would therefore seem to have less information. If you think about an object like the Sun, it has a certain chemical composition, and it’s giving off light with different wavelengths having varying intensities. There are sunspots, solar flares, convection flows that create granules, and the list goes on. The Sun is a deeply complex object that we have yet to fully understand. The Sun contains a tremendous amount of information. And yet, if our Sun were compressed into a black hole, all that information would be reduced to mass, rotation and charge. All that information is lost forever. How Hawking radiation might work. Credit: Ethan Siegel. But perhaps information can be saved by quantum theory. In the 1970s Stephen Hawking showed that one of the consequences of quantum theory is that black holes cannot hold matter forever. Instead, black holes can leak mass in the form of light and particles through a process known as Hawking radiation. While Stephen Hawking’s clever bit of mathematics describing this effect is pretty straightforward, interpreting the mechanism is less clear. 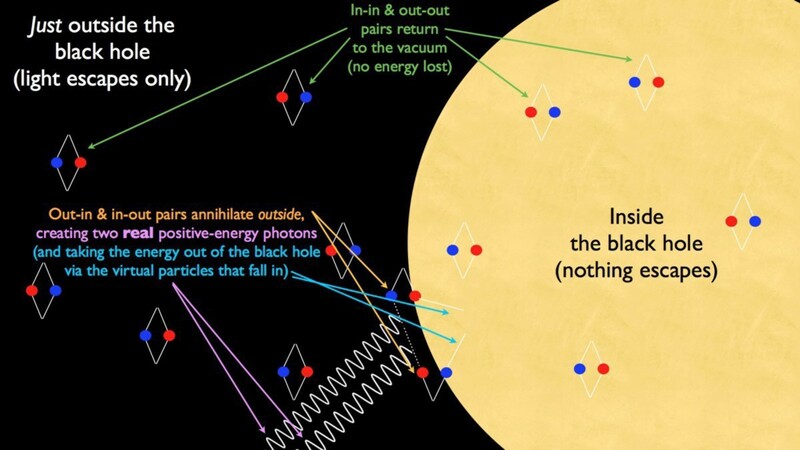 One way of looking at it is that the Heisenberg uncertainty principle (which gives quantum theory its fuzzy behavior) means that virtual quantum particles can briefly appear in the vacuum of space, then then quickly disappear. In the normal, everyday world, these particles average out to zero, so we never notice them. But near the event horizon of a black hole, some of these virtual particles could cross the event horizon before disappearing, which decreases the mass (energy) of the black hole and allows other virtual particles to become “real” and radiate energy away. Another view is that the inherent fuzziness of quantum particles means you can never be absolutely certain that it is inside the event horizon. Although a particle cannot escape the black hole by crossing the event horizon, it could find itself outside the black hole through a kind of quantum tunneling. Since a “quantum” black hole emits heat and light, it therefore has a temperature. This means black holes are subject to the laws of thermodynamics. Integrating general relativity, quantum mechanics and thermodynamics into a comprehensive description of black holes is quite complicated, but the basic properties can be expressed as a fairly simple set of rules known as black hole thermodynamics. Essentially these are the laws of thermodynamics re-expressed in terms of properties of black holes. As with regular thermodynamics, the entropy of a black hole system cannot decrease. 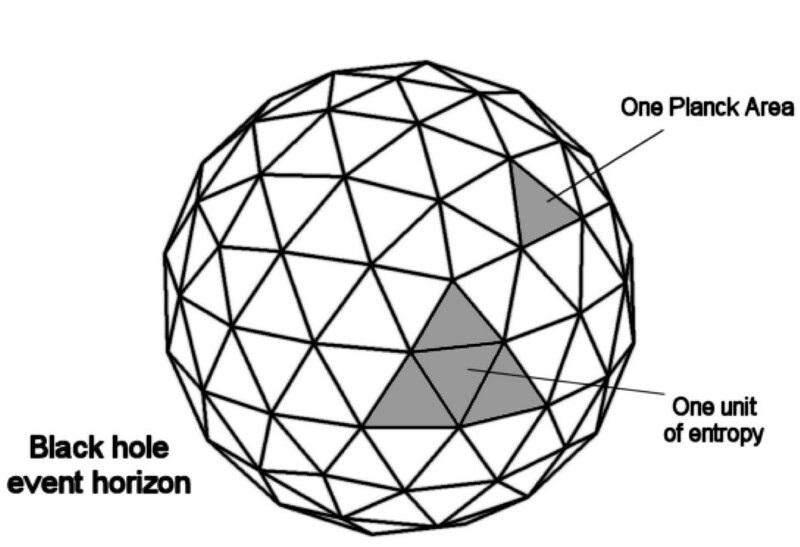 One consequence of this is that when two black holes merge, the surface area of the merged event horizon must be greater than the surface areas of the original black holes. But remember that thermodynamics and entropy are a way to describe the information of a system. Because black holes have entropy, they also contain information beyond the simple mass, rotation, charge. Perhaps the information isn’t destroyed after all! Unfortunately there’s a snag. Just like any quantum process, Hawking radiation is probabilistically determined. 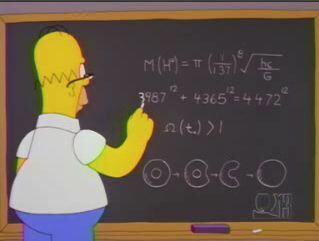 But it’s determined by the basic properties of the black hole. According to Hawking’s original theory, when a black hole evaporates, it evaporates into a random mix of light and matter. Not just “kind of” random, like tossing a dice, but truly random. This eliminates any possibility of recovering information from a black hole. So it would seem Hawking radiation also destroys information. 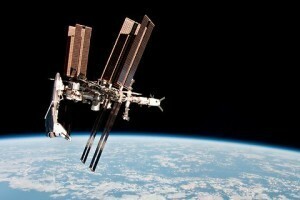 But several people have looked at modifications to Hawking’s model that would allow information to escape. For example, because Hawking’s quantum particles appear in pairs, they are “entangled” (connected in a quantum way). Perhaps you can used this quantum connection to give the information a way to escape. It turns out that to allow Hawking radiation to carry information out of the black hole, the entangled connection between particle pairs must be broken at the event horizon, so that the escaping particle can instead be entangled with the information-carrying matter within the black hole. 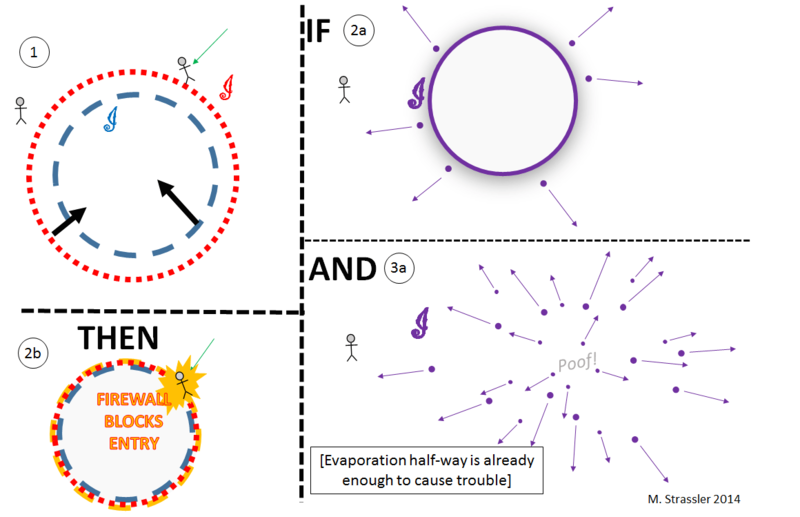 This breaking of the original entanglement would make the escaping particles appear as an intense “firewall” at the surface of the event horizon. This would mean that anything falling toward the black hole wouldn’t make it into the black hole. Instead it would be vaporized by Hawking radiation when it reached the event horizon. This is known as the firewall paradox. It would seem then that either the physical information of an object is lost when it falls into a black hole (information paradox) or objects are vaporized before entering a black hole (firewall paradox). Basically these ideas strike at the heart of the contradiction between general relativity and quantum theory. This brings us to Stephen Hawking, and all the hullabaloo about his announcement that he’s solved the information paradox. Has he? The truth is we don’t know, but probably not. Hawking knows his stuff, but so do lots of other folks who have been working on this problem for years with less media attention. So far no one has been able to crack this nut. Hawking also hasn’t released a formal paper yet. So not only is his idea not peer reviewed, it’s not even public. Until we see the details there will be more speculation than facts. But we do know a few things about the idea, and one interesting aspect is the fact that it’s not a quantum model. It actually draws upon the ideas of thermodynamics. Time for a little history. In the late 1800s Ludwig Boltzmann proposed that the properties of a gas, such as its temperature and pressure, were due to the the motion and interactions of atoms and molecules. This had several advantages. 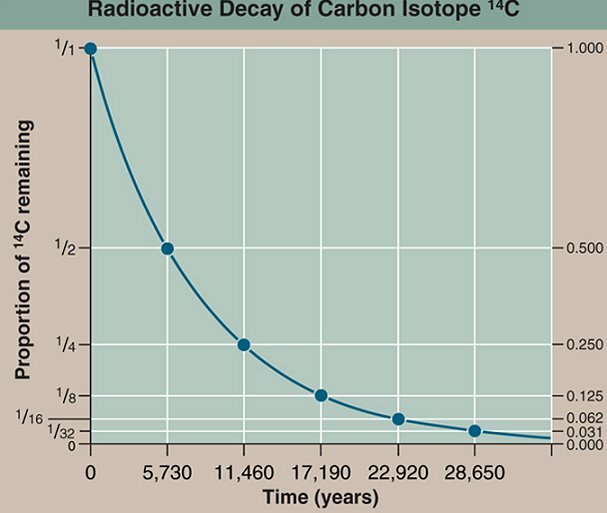 For example, the hotter a gas, the faster the atoms and molecules would bounce around, therefore temperature was a measure of the kinetic (moving) energy of the atoms. The pressure of a gas is due to the atoms and molecules bouncing off the walls of the container. If the gas is heated, the atoms move faster and bounce off the container walls harder and more frequently. This explains why the pressure of an enclosed gas increases when you heat it. These microstates all have 15 red circles. The idea of equivalent microstates can be applied to general relativity through an idea known as degenerate vacuua. The region outside a black hole (the vacuum) is the same for a black hole with a particular mass, rotation and charge. But lots of things could have gone into making the black hole, from stars to old issues of National Geographic. A black hole made of hydrogen, or neutrons, or iron all look the same from the outside, so we could say that each type of black hole is a microstate, and thus all the different ways we could make a black hole are therefore equivalent microstates. Or in general relativity terms, their exteriors are degenerate vacua. These different vacua are related by a type of symmetry relation known as BCS symmetry, or supertranslations. What Hawking seems to be saying is that these supertranslations can be used to connect the information inside a black hole with the outside world. Basically, these degnenerate vacua bias the Hawking radiation so that it isn’t random. That way the information can escape without creating a firewall. If the idea works, then it might solve the information paradox. But even the little information released about the work has raised some serious doubts from other experts. 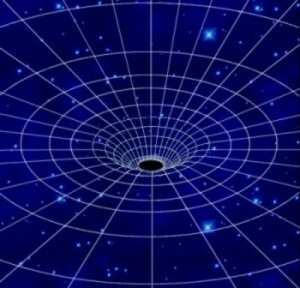 It seems to be based upon an idealized black hole that doesn’t match real black holes, and it might not work even then. Either way, it’s up for Hawking and his colleagues to prove their case. So we still don’t know whether black holes tell no tales. If you’ve made it this far, congratulations. This is a deeply complex topic, and while I’ve done my best to explain what I understand about it, I won’t claim to be an authority. Fortunately lots of other scientists have written about it as well. For a few good summaries check out Sabine Hossenfelder, Ethan Siegel, and Matt Strassler. I’ve been waiting to read your prospective on Dr. Hawking’s announcement. Thank you Dr. Koberlein for an excellent piece. I feel a bit bad for Hawking and the way the media hypes every thing he says. He could be idly studying the walking patterns of a cat and the media would immediately publish it on their front pages. I’m left wondering exactly what “information” is in this context. How is it that just taking a book and burning it is different from throwing it into a black hole? I mean that in terms of rendering the “information” unretrievable. It’s all about “in principle.” In principle, you could track the trajectories of all the molecules in the ash, and trace their motion backwards to recreate the book. For a black hole, Hawking radiation would be truly random, so you couldn’t trace things back. anyone try with white hole solve this problem? if (i know this is big if ) WH exist then is no paradox infomation is not lost he just change hes location?? from this point of viev our problem with BH is only result for looking in one side of bigger more complex object or this to much crazy idea ?? Prof, on a “universe is information” tangent, I have a question and I hope you can offer insight I don’t have. There’s lots of crackpot ideas on how our universe is actually a computer simulation, but have you come across Brian Whitworth’s article/book? As far as I can tell, he’s not saying current scientific evidence is wrong or other such common conspiracy claims. Rather, he’s challenging current basic philosophical assumptions in Physics (similar to what you described in your “Plato Aristotle Socrates Morons” post). He’s saying that current Physics is increasingly tying itself in mathematical knots in order to interpret the evidence, and perhaps a new unconventional point of view will lead to the Grand Unified Theory of our dreams. I think he was brought into the popular consciousness when his ideas were used in the show Through The Wormhole (popular science clickbait in the form of TV). I want to ask a question about the curvature of space time near and inside a massive body. As one approaches say a planet or a star, the distortion of spacetime increases up until the point you reach the surface. Once you enter the body, and start to move towards the centre of the body, what happens to the curvature of space time – my understanding based on gaussian inverse squared behaviour of field strength inside a shell is it should decrease – i.e. only be due to the mass “below” you. I wonder though – the surface disappearing, from an external observer, would slow down, just as described above – is there a circumstance where the Schwarzschild radius conditions are reached inside the surface of the neutron star… In which case, you could still see the surface of the star, for ever. It always bugs me a bit when people talk of quantum physics being fundamentally probabilistic, when none of the processes are probabilistic. The Schrödinger equation produces yields a state that is exactly determined by the initial state, and so do all other purely quantum physical models, including those operating on mixed states, *unless* you trace more things out of the system, i.e. ignore information you already knew or ignore information added to the system. “Measurement”, as much as it’s talked about in the context of quantum physics, cannot be described as a quantum physical process unless it’s a unitary operation, which can only be done if you include the things measuring the quantum system in the state, in which case, it’s deterministic. It’s only when you ignore (trace out) the state of the measurement apparatus and observers that you get a probabilistic result. Thus, the only source of randomness in the quantum system is everything that you *don’t* treat as a quantum system, not the quantum system itself. If you consider the universe to be in a pure quantum state at some point in time and only acting by the laws of quantum physics, it will always remain in a pure quantum state, and thus entropy is a constant zero, i.e. 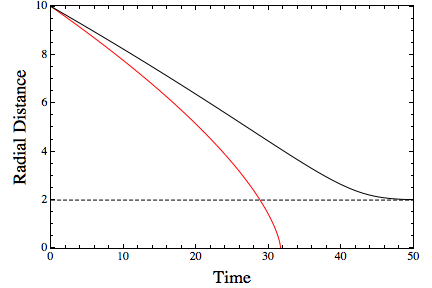 probability 1 of being in a single quantum state at each point in time. If you consider such a universe to be in a mixed quantum state at some point in time, entropy still remains constant. (1) Assume that you know what you’re talking about, and assume that the reason you sound so “controversial” is because popular science sources (even the most responsible ones) have been “lying to us”, simplifying the details and giving us a false superficial understanding. While this is possible, IMO it is very unlikely that this most fundamental principle of “quantum mechanics is probabilistic” is a case of over-simplification. Why? Because we have way too many credible sources relaying that principle to us. Even Bohr basically said QM is probabilistic when arguing with Einstein; he certainly wouldn’t be “dumbing things down” for Einstein in a scientific debate. (2) Assume that the reason your post is so indecipherable is precisely because it is indecipherable: It is pseudoscientific babble by someone good at making falsehood sound intelligent. This is because even wrong conclusions can seem intelligent; all it takes is one mistake in the equations. A mathematician acquaintance of mine gave a more favorable interpretation of your post. He thinks you weren’t being controversial, but simply did a bad job of making your point. I’ll paste his full explanation below. His explanation I understood, despite it being dense. TL;DR he clarified to me that you were saying that the functions are deterministic, but what we can measure “in this world” is not. No, what he’s saying is that if you consider the wavefunction to actually be real in and of itself, rather than just describing a probability distribution, then the equation of motion for that wavefunction is deterministic. The equation of motion of the wavefunction is the representation of the laws of physics – it’s the recipe for relating configurations to each other over time. The randomness comes from making a map from the wavefunction to a down-projection of the wavefunction to a different type of mathematical object (what is called a ‘measurement’ in quantum mechanics). That down-projection violates a conservation law which is part of the equations of motion of the wavefunction (integral |psi|^2 = 1). That means that the operation of the down-projection isn’t actually consistent with the laws of physics written down to govern the wave-function’s evolution. E.g. it is a mathematical event rather than a physical event – nothing in the wavefunction or its evolution tells you that a measurement is about to happen. And in fact, you can always shift a set of measurements in time arbitrarily, so long as you preserve the ordering of measurements, and get the same exact results. To put it another way, quantum mechanics says that the right way to describe the universe is not as a set of particles with positions ‘x’, but rather to use a joint function over the (very high dimensional) space spanned by all possible values of all the various x’s (and when you go to field theory, it goes a step further with ‘second quantization’, where you also write the wavefunction over the number of particles present, which basically takes into account that particle count is not a conserved quantity). That joint function is the ‘real’ thing, and the calculation of a measurement is a way to take that wavefunction and project it down to a specific value of the ‘x’s – which is what we macroscopically are able to observe. The tricky bit is that both the experimenter and the experiment are part of that joint function. So to properly do the entire thing as a quantum system, you’d need to write a wavefunction over both the ‘x’ of the particle you’re measuring and also over all the degrees of freedom which describe the experimental apparatus, the experimenter, their brain, their perception of the result, etc, etc. And basically, that’s untenable. So instead, you have to use a projection which implicitly integrates over all of those possibilities. Another way to put it is that if you think of the different projections of the full wavefunction as states which you could be in, you could ask ‘what could someone limited to the information of one projection of the wavefunction infer about this other projection of the wavefunction?’. That question is what you’re asking mathematically when you write down a quantum measurement. The reason you need to hypothesize that limitation is that you, as the experimenter, are also part of the full quantum system. There’s a bit extra having to do with the linearity of quantum mechanics that matters here, but it gets a bit more mathy. Basically you could ask, how do you know that one component state of the full wavefunction can’t ‘know’ about the amplitude of another component state (e.g. have temporal correlations which allows that to be determined post-hoc)? However, since QM is linear, you can add and subtract solutions of the wave equation and still have a solution of the wave equation. That is to say, solutions are decomposable in such a way that their time evolutions are completely and totally independent. So even if you do an experiment and measure the particle position ‘x=1’, there’s no way to know what the amplitude in the full wavefunction for ‘x=0’ or ‘x=-1’ or whatever (including versions of you observing those values) would be. At best, you can use the overall conservation law integral |psi|^2 = 1 to constrain the maximum possible integrated squared amplitude of those other components. What NichG described applies only to the Everett-type interpretations. If the wavefunction is actually real (i.e., ontic), then it contains everything that physically exists, whether or not describable by mathematical law. It need not be deterministic or linear. Some interpretations even postulate a random noise component. Why are you taking Information Theory seriously? On the one hand, if determinism is a scientific claim, then the experimental evidence of randomness that seems to be irreducible should have falsified it. On the other hand, if determinism is a metaphysical claim, and if by black holes you mean the actual mysterious objects found in the center of some galaxies, then referring to both in the same essay is an unwarranted act of faith. On the gripping hand, if by black holes you mean the mathematical anomaly pilpulled about by Stephen Hawking and company, then the information paradox is just an amusing riddle.